Finally! 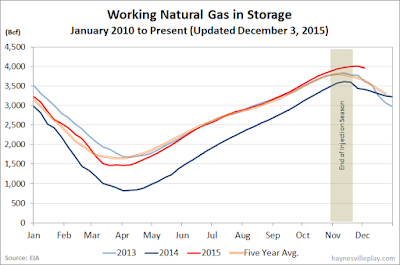 The EIA announced this morning that working gas in storage was down 53 Bcf to 3.956 Tcf. The first withdrawal of the season was 26% greater than last year (-42 Bcf) and 10% larger than the five year average (-48 Bcf). The current storage level is now 15.9% above last year (3.413 Tcf, a difference of 543 Bcf) and 6.7% higher than the five year average (3.709 Tcf, a difference of 247 Bcf). Now that the storage injection season is over, it's time to reflect on the big picture. 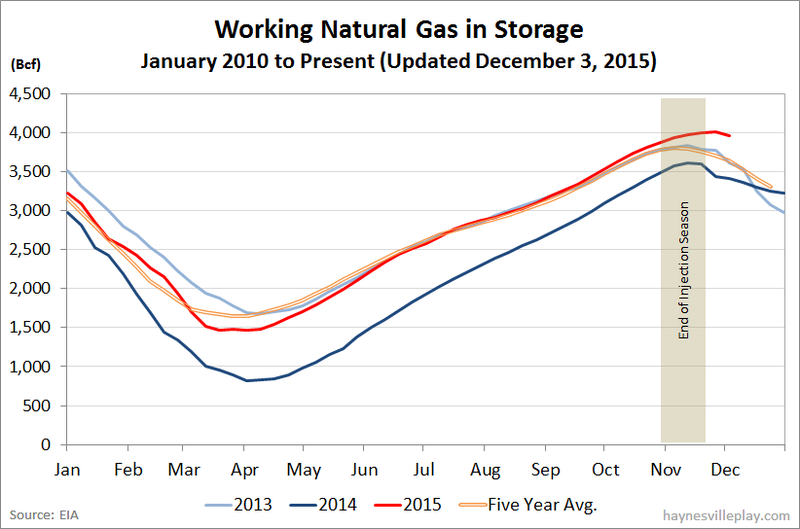 Storage reached a record 4.009 Tcf, by far the highest level in history. Getting down to 1.5 Tcf at the end of the injection season is likely impossible without a new ice age commencing in the next two weeks. Unfortunately, 2.0 Tcf - which entails a 2.0 Tcf withdrawal - seems like a stretch too, especially with a warm winter predicted. Last week, EIA announced that natural gas consumption in September 2015 reached a record high (EIA began collecting data in 1997) of 64.0 Bcf/day, which was 5.7% greater than the same month in 2014. Sounds great, right? In the same announcement, EIA also noted that production in September set a new high level of 76.3 Bcf/day, which was 5.8% higher than the previous year. With gas starting to flow faster from the Utica shale than it declines from the Marcellus, it looks like production will continue to overshadow gains in consumption to keep pressure on storage and a lid on prices for quite a while. "Temperatures in the Lower 48 states averaged 44° for the storage report week, 1° warmer than the 30-year normal temperature and 1° warmer than the average temperature during the same week last year. There were 151 population-weighted heating degree days (HDD) during this report week, 18 HDD more than the five-year average and 8 HDD fewer than during the same period last year."